This package can be used to manage CSV text files like database tables. The class combines most benefits of SQL tables and PHP arrays including a powerfull method for sorting rows. The class manages CSV files with support for storing, retrieving and deleting rows of data and also to add and remove columns from those files. Inserted row identifier column values may be auto-incremented. The row retrieval is binary safe, may obey a given column sorting criteria similar to SQL ORDER BY clause, limit the number of retrieved rows similar to LIMIT clause, and support joins like with SQL LEFT OUTER JOIN. A separate sub-class allows importing and exporting data to MySQL database tables. 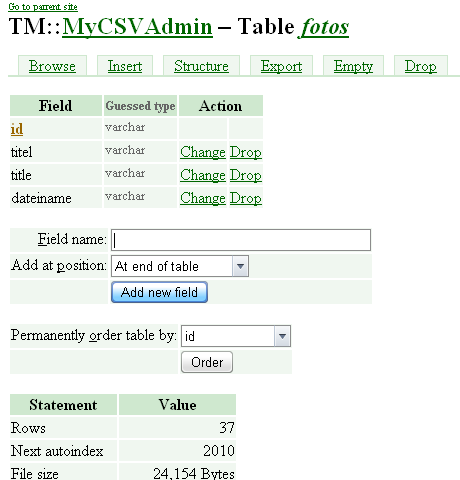 Another class can generate a HTML forms based administration interface for accessing and editing data from a directory of CSV files, as well as alter their columns. MyCSVAdmin_Structure.png Screen Editing the CSV text files table structure in the Administrator. MyCSVAdmin_Edit_with_Join.png Screen Editing a CSV table row in the Administrator with a join (lookup) to another CSV table. Prize: One copy of the Zend Studio PHPMyAdmin is an application that became very popular because it provides a Web based user interface to let the users manager MySQL databases used by PHP Web sites. This package provides a similar Web based user interface for managing data in CSV files.